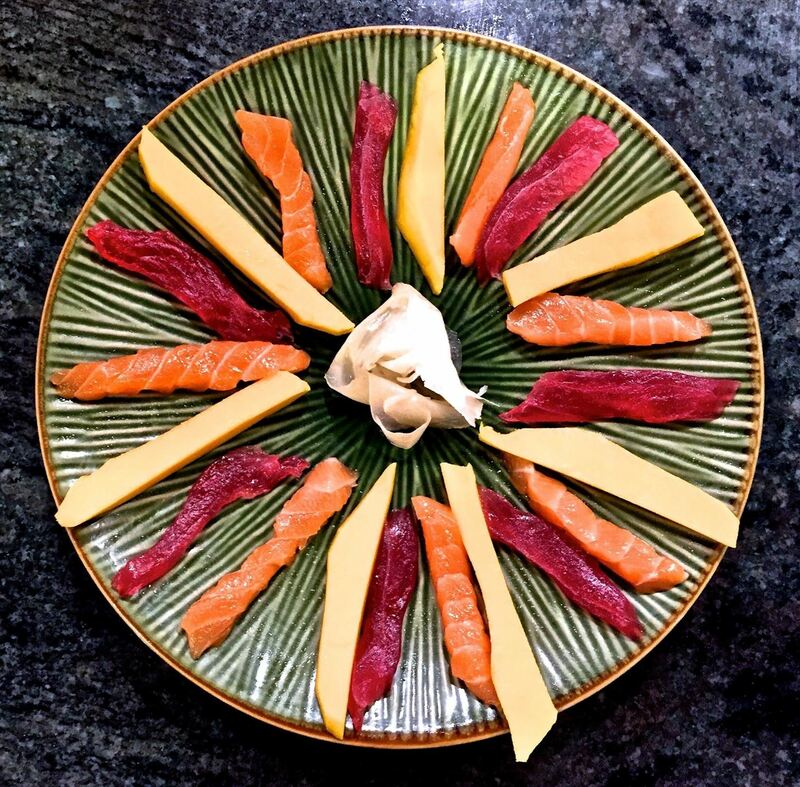 Without a doubt, sushi is one of my favorite foods—dainty and delectable, while also fun to make. So let's get started with maki rolls, aka makizushi, probably the most iconic form of sushi. 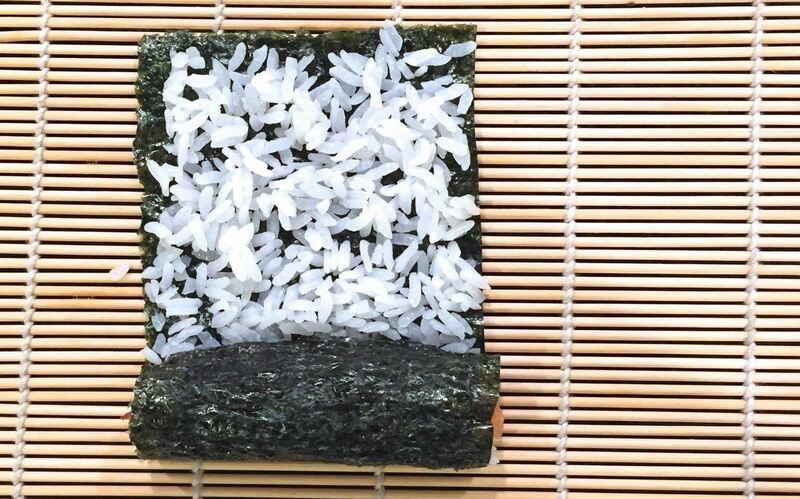 You know, the one filled with rice and your standard sushi ingredients, rolled up in a sheet of dried seaweed. This recipe uses mango, salmon, tuna, sesame seeds, chili flakes, nori, and sushi rice. 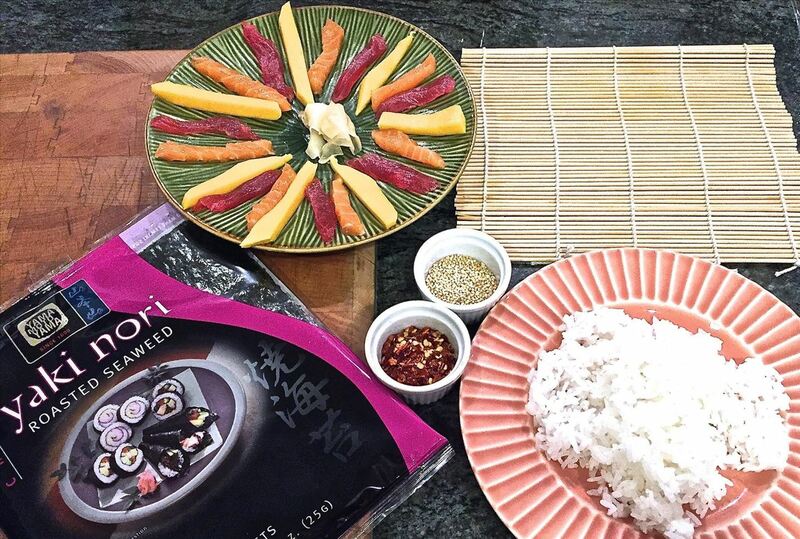 Aside from having a good bamboo sushi rolling mat on hand (though, you can also make great sushi rolls at home without one), you'll need three major things to make maki rolls at home. 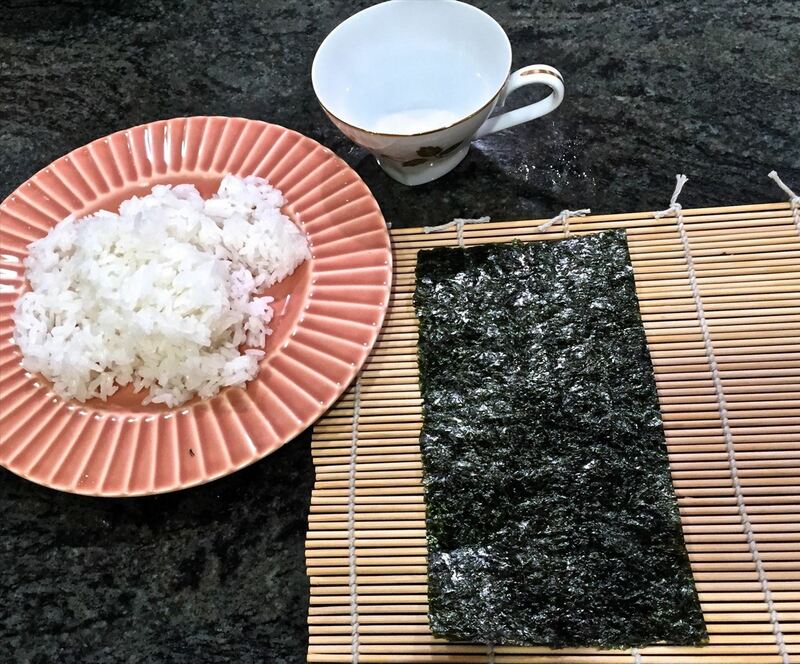 Nori is a type of seaweed, and you can get sheets of roasted nori in most Asian markets and specialty food shops, such as Whole Foods. And while the professionals can easily roll sushi with full size sheets or nori, I suggest that beginners cut the sheets in half and work with that size. 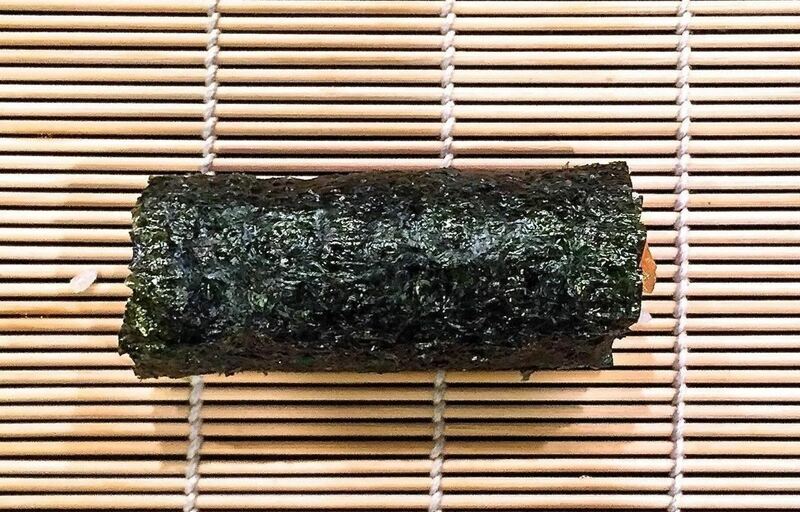 Having a smaller sheet of nori gives you more control over the sushi roll. Nori absorbs moisture pretty easily. 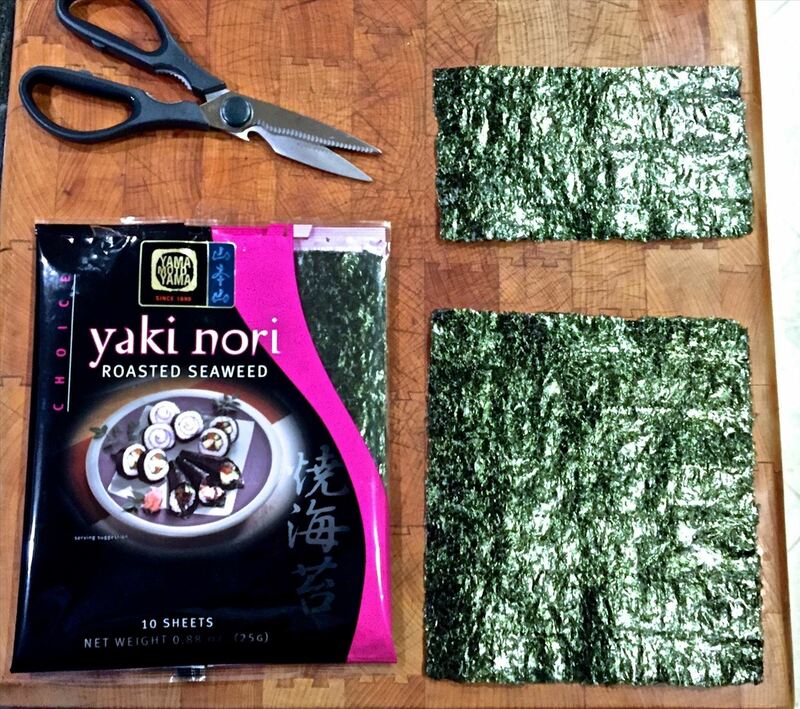 So unless you use all 10 sheets of the nori in one sitting, you want to save it for later. For best results, seal in a ziplock bag, but also put in a teaspoon of uncooked rice to absorb any moisture. Then, the next time you go for nori, it'll still be nice and crisp! But if you're lazy like me, you can buy pre-made sticky rice, and simply add 2 tablespoons of seasoned rice vinegar for every cup of rice. Make sure to buy seasoned rice vinegar. Regular rice vinegar doesn't contain the sugar that you need for sushi rice to have a slightly sweet flavor. If you accidentally get regular rice vinegar, just add 1 tablespoon of sugar to every half cup of vinegar. For the extremely lazy, you can just buy sushi rice from certain locations like Japanese markets and Whole Foods for a few bucks. But you didn't hear that from me. When it comes to deciding on the fillings for your sushi, the sky's the limit. 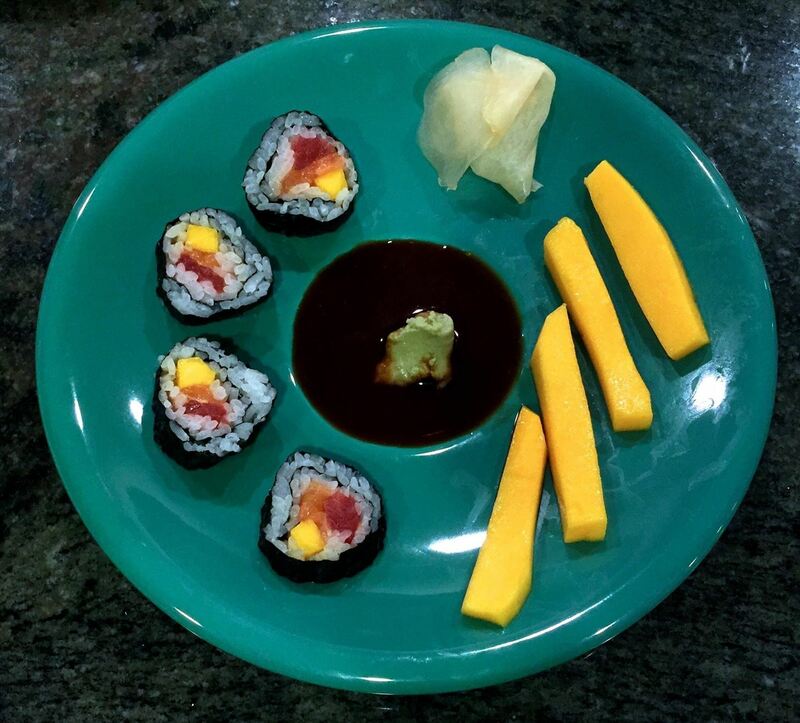 Common ingredients include raw fish (pictured here are salmon and tuna), crab, tempura, mango (also pictured here), avocado, cucumber, carrots, and the list goes on. Whatever your heart desires—go for it. Just make sure that you cut into small strips. 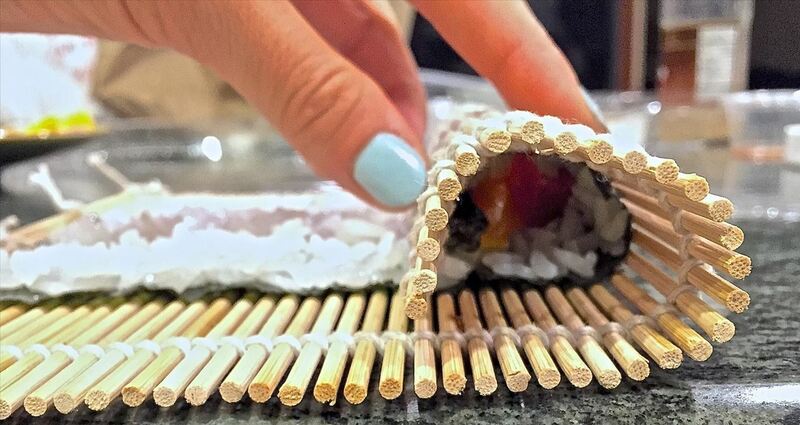 When you buy fish for your sushi rolls, the fresher the better. To test the freshness, push down with your index finger on the fish meat. If it's fresh, it should spring back. If it's not as fresh, there will be an indentation. The fish is still perfectly edible if there is an indentation, it just means that it's not quite as fresh as it could be. 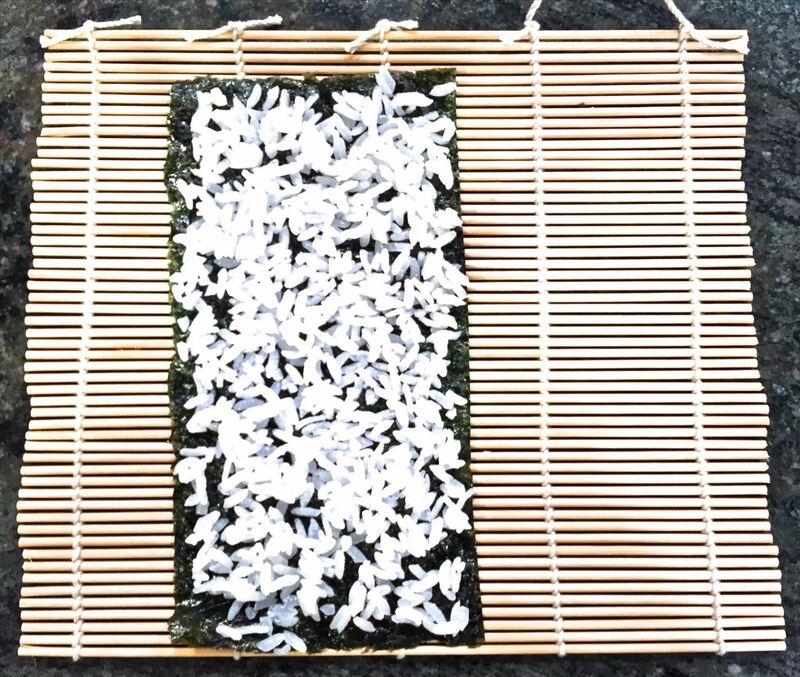 Lay out the nori on the bamboo mat (or whatever you're using). Feel the nori; there should be a rough side and a smooth side. Make sure that the rough side is facing up. Make sure not go over the bottom quarter! Otherwise, it will be hard to roll. Give the roll a gentle squeeze to compress the ingredients. 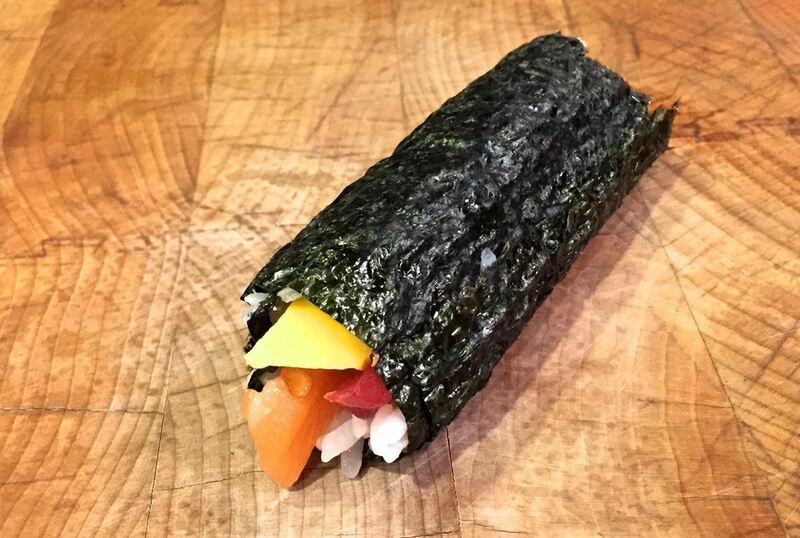 Roll the rest of the roll up into a little Japanese burrito, using your fingers. 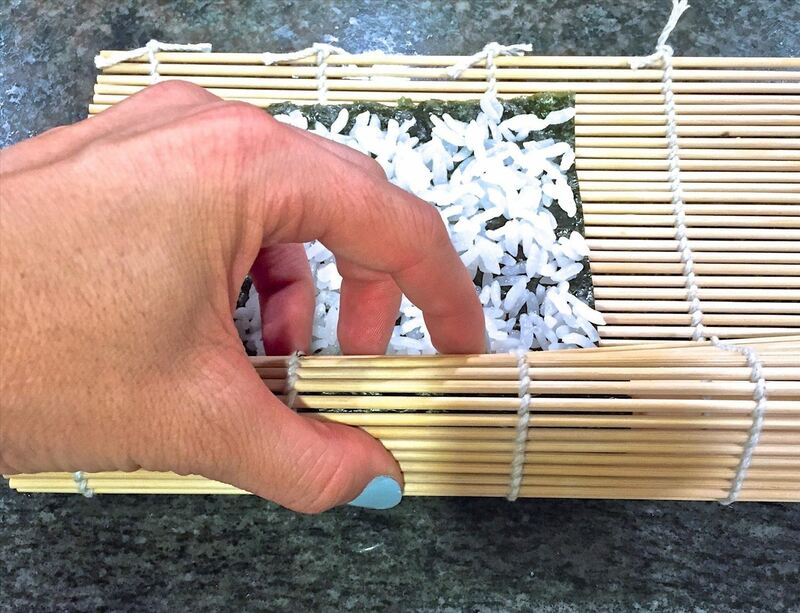 Use the bamboo mat to compress the roll again, squeezing gently. 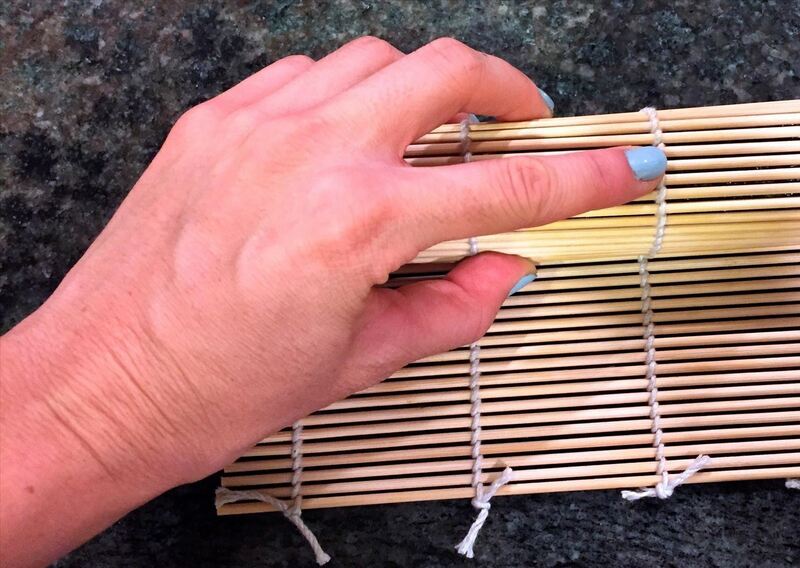 Remove the mat and place the roll on a cutting board. Using a very sharp knife, cut it into rounds. Make sure to clean the blade of the knife after every time you cut off a piece of sushi. 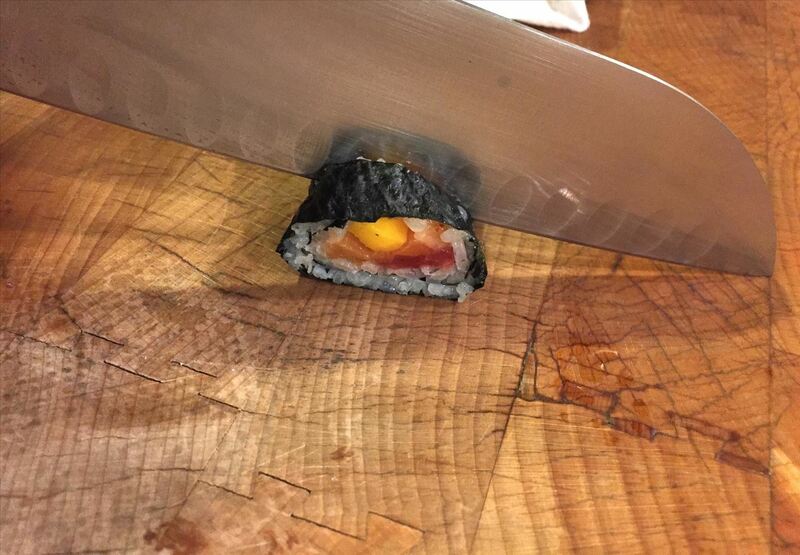 The blade will quickly become sticky, so if you don't clean it, the sushi will be very difficult to cut. 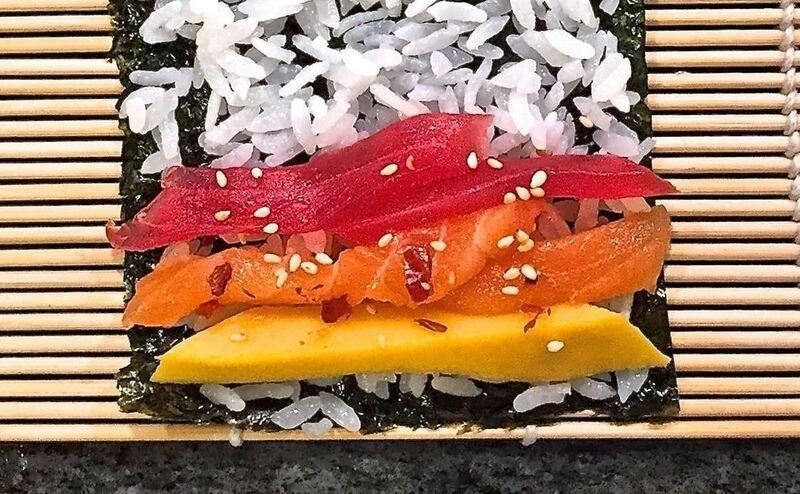 Arrange on a plate and ta-da... beautiful sushi.